A group of sixteen enthusiastic volunteers, including Princeton undergraduates, Princeton community members, Wikipedians from the Wikimedia-New York City, and Mudd Library staff, gathered in the Wiess Lounge on Saturday, 18 February 2012, to write and update Princetoniana Wikipedia articles. 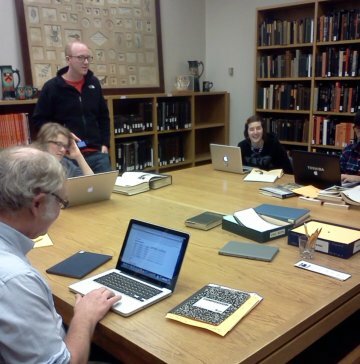 In July 2011, I participated in an edit-a-thon about the Armory Show at the Archives of American Art in Washington, D.C. A Wikipedia edit-a-thon is a gathering of individuals creating Wikipedia articles and uploading media related to a theme, events, subjects, or places. Once I saw firsthand how GLAM (Galleries, Libraries, Archives, and Museums) institutions and Wikipedia can benefit one another, I returned to Princeton and my student job at the Princeton University Archives inspired to act on this experience. After discussing the idea with University Archivist Dan Linke, we decided to host an edit-a-thon in February with the theme of “A Valentine for Princeton.” The goal was to have participants update pages on Princeton’s presidents and other Princetoniana materials. On the day of the event, after introductions over pizza and Indian food, I gave a brief PowerPoint presentation describing basic principles of Wikipedia articles: notability, neutral point of view, reliable sources, and individual accountability. Reference Archivist Christie Peterson introduced the reference room and the sources available for participants to browse. After that, we were off! Discussing the finer points of Wikipedia. While writing articles about topics such as Seeley G. Mudd Library to the Putnam Collection of Sculpture to the East Asian Studies Department, and updating articles about the Log College, the Two Dickinson Street Co-op, and the Joseph Henry House, we used reference room publications and online resources to increase the number and reliability of Wikipedia articles about Princeton University. We look forward to holding more edit-a-thons in the future! This entry was posted in Library News and tagged Joseph Henry, Log College, wikimedia, Wikipedia by Christa Cleeton. Bookmark the permalink. We are planning another Edit-a-thon for May 19, 2012. 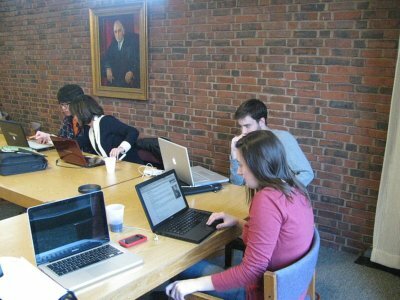 The Princeton University Archives is hosting a Wikipedia Edit-a-Thon on the theme of Women at Princeton! WHO: Interested University community members (students, graduate students, professors, staff, community). Limited to 15 participants; please RSVP before Wednesday, 16 May 2012. 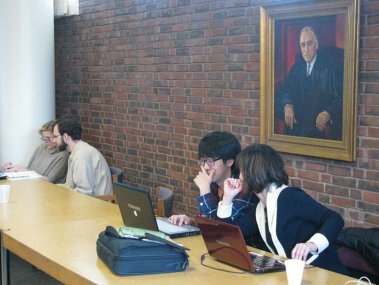 WHAT: Creating and expanding existing Wikipedia pages about the history of women at Princeton as faculty members, wives, visitors, and students; and on the history of coeducation at Princeton. 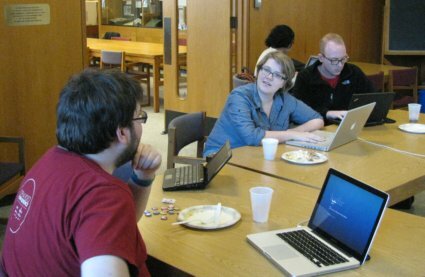 Participants will set up individual Wikipedia accounts, learn how to write an article, and then use University Archives resources to write and edit articles. WHEN: Saturday, 19 May 2012, 12:30 P.M.-4:00 P.M. Lunch and snacks will be provided. WHERE: Wiess Lounge, Seeley G. Mudd Manuscript Library (next to Sherrerd Hall and across from the Friend Center). WHY: To increase the number of pages on Wikipedia about the history and roles of women at Princeton and to help close the Wikipedia Gender Gap. OTHER: Please bring your laptop since you will be asked to create a Wikipedia account (if you do not already have one; you are not required to have an account before participating). Sounds like an amazing meeting, I am sure it was very productive way! Great writeup of what sounds like a great event! Thanks for carrying this forward, Q. Wish I could have been there to be part of this work! And yes, thanks for taking the time to write up the how-to as well — I think it will be tremendously valuable to me and many others. Excellent! Thanks for this write-up, and double thanks for also working on an edit-a-thon how-to! I’m writing an edit-a-thon how-to that will link from the /GLAM page on Wikipedia outreach. I’ll post a link to it from the meetup page for this event. I hope to have the guide written by next week! This sounds fantastic! 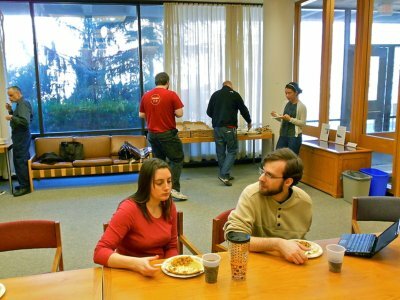 Do you have any tips on organizing a successful editathon? I’d love to organize something like this at CU Boulder someday.